From now through January 15th, 2013 all of my Fine Art Prints and Giclée Canvas Wraps are 20% off! Just use the code FALL20 at checkout. Most of my images can be purchased directly from my Gallery. Details on this can be found on the Purchase page in the menu above or if you have any questions just send me an email. If you are interested in a photo that is not yet in my gallery but instead found here on my photoblog or on a social media site, please send me an email indicating which photograph you are interested in and what size/product you wish to order – the discount will still apply! 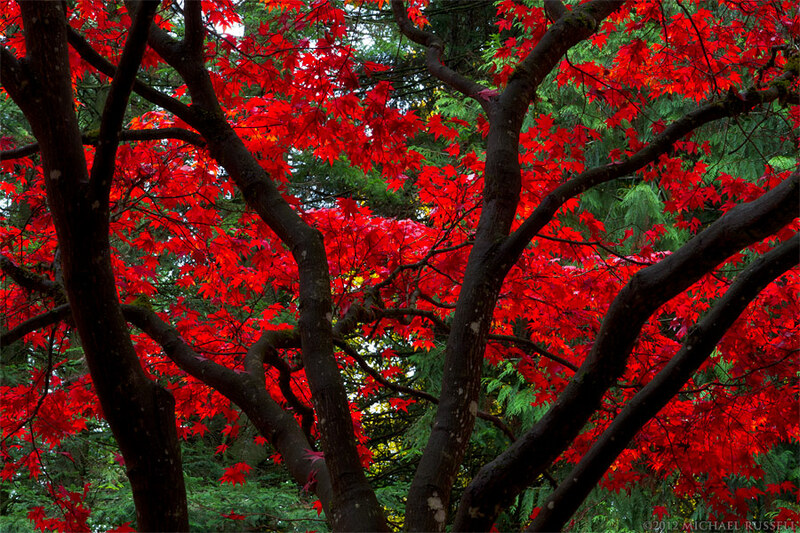 The photo above is a Japanese Maple (Acer japonica) I found last week while looking for Fall colour. I had been looking for some native Maples, but I really liked the red in this against the green Cedars and the dark trunk.